GrassrootsHealth was established to change the paradigm of moving research into practice. With a panel of 48 vitamin D scientists, and 10,000 self-subscribed participants, GrassrootsHealth has worked to demonstrate how to rapidly move research into practice. 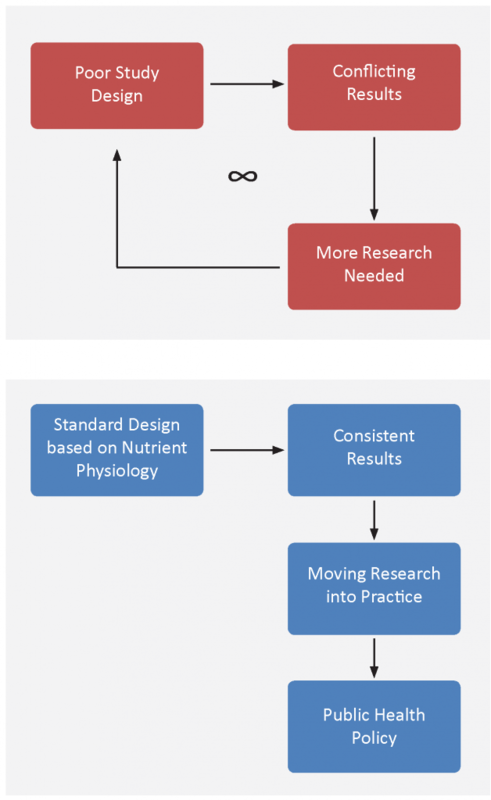 One major topic of education has been the importance of using standardized RCT criteria as it applies to nutrient research. Basal Nutrient status must be measured, used as an inclusion criterion for entry into study, and recorded in the report of the trial. 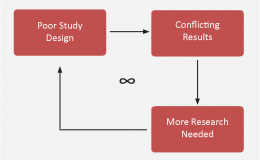 The intervention (i.e., change in nutrient exposure or intake) must be large enough to change nutrient status and must be quantified by suitable analyses. The change in nutrient status produced in those enrolled in the trials must be measured and recorded in the report of the trial. The hypothesis to be tested must be that a change in nutrient status (not just a change in intake) produces the sought-for effect. Co-nutrient status must be optimized in order to ensure that the test nutrient is the only nutrition-related, limiting factor in the response. Measure 25(OH)D for all participants at the beginning of the trial. Baseline 25(OH)D should be an inclusion criterion, including only those below the response range (typically <20 ng/ml). Sufficient dose of vitamin D to raise 25(OH)D concentrations among most treatment group participants into the therapeutic range (40-60 ng/ml for many conditions). Continue to measure and record 25(OH)D at time points during the trial, and at the end of the trial. Hypothesis should be that increased serum 25(OH)D into the therapeutic range (40-60 ng/ml for many conditions) will produce the specified effect (less disease, reduced symptoms, etc.). Co-nutrients for vitamin D studies would include calcium, K, and magnesium among others. Calcium levels and urine calcium/creatinine levels should be measured at the same time points as 25(OH)D.
An example of the second and forth guidelines put into affect, and the difference made in study outcome, can be observed when looking at the data from a recent RCT by Wagner et al. 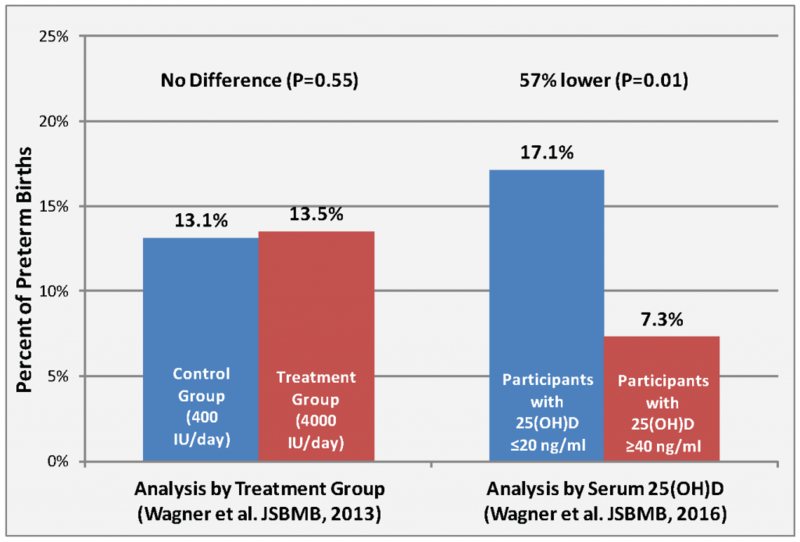 When analyzing the same data by serum 25(OH)D (guideline #4) and ensuring a 25(OH)D change over a large enough range (guideline #2), a significant vitamin D effect was observed.